I have been doodling lately and discovered two of my "styles". I really have grown fond of what I draw. The ones that are really creepy looking style usually has me tormenting people (a.k.a. pulling people's bra straps. You know, when you come behind and pull someone's shirt and pinch their bra straps with it and you pull it back and let go, yeah, makes good use for personal enjoyment, not so much for my lucky victim). That's really more a post that should be in the FanArt thread, unless they're just random drawings. They are, in fact, random doodles. I have not quite felt comfortable enough to draw Doofy yet in fear that my picture would turn out awful and I'll never be able to look at him the same way again. Bleh, anyways, they are random doodles, as I believe I have already mentioned but who cares, this is my conslusion? I accidentally drew out of the lines in a couple places and it's pretty bad. I also accidentally tampered with some color thing while editting it [all I wanted was a deeper purple =( ] so it'll look a little funky. Bleh, whatever. I can picture everything perfectly in my mind, but have no skill in putting it on paper. So far, the most I can do is eyes, similar to the one ChatterBox did. Roy42 wrote: I can picture everything perfectly in my mind, but have no skill in putting it on paper. 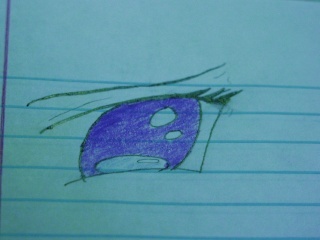 So far, the most I can do is eyes, similar to the one ChatterBox did. That's often a problem with me also. The same goes in wtriting. I can hava good idea of what to draw or to write, but when it comes to expression, everything falls apart. Heh, I just spend the three odd hours in the car back home drawing whatever random things my brothers threw at me on one of those notepads from hotel rooms. xD For stuff drawn in a moving car, I'm actually quite pleased. Funny, for me, the eyes are the hardest part of the basic line-thingy (the actual hardest part is shading, and folds in clothes. I can't do it at all.) You did a good job there, ChatterBox. Good anime! I really like the deep purple. 2) Music- I play violin, french horn, clarinet, and piano. And we have to learn harmonica at school. 3) Writing- I'm writing a novel.